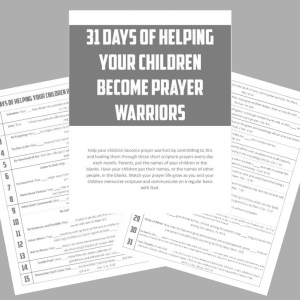 How can you help your children develop the characteristics of a prayer warrior? How do you get kids to move beyond, “Thank you for my dog. Thank you for my toys.” type prayers? 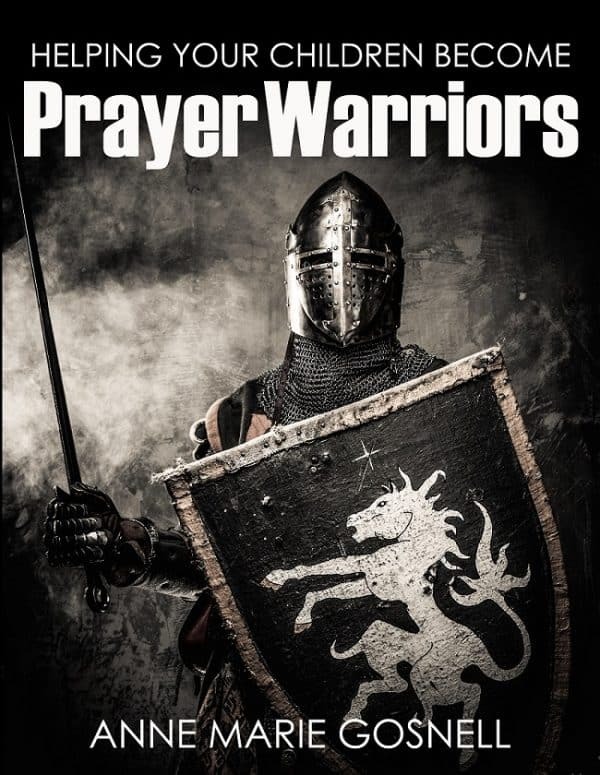 You need a guide filled with prayer activities for everyday life! Many adults don’t tap into the full power of prayer. Our children need to understand that lives change because of prayer! The Bible tells us that our fight in this world is not with people, but with powers of darkness. There is a spiritual realm of which we pay little attention. And that makes us weak Christians. 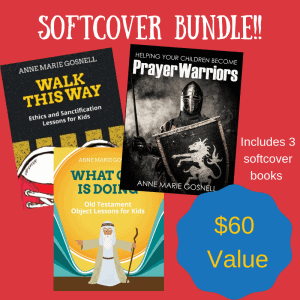 Once you have chosen a few of the cards that your child needs at this point of life, the book guides you through how to turn the scriptures into a prayer. Read through the cards on a regular basis to form a habit of prayer, such as at bedtime, or first thing in the morning. As life changes, go back to the scripture cards and pull out ones your child needs as he or she grows. This book is perfect for parents who desire to teach a hands-on approach to prayer. Practice makes perfect, and prayer is no different. Prayer is work. This is a perfect resource for churches to share with parents, and for church volunteers or staff to use as a prayer guide to teach prayer to children. I simply love this book. From the moment I got it I couldn’t put it down! So much insight and also so practical. I can not wait to use it in my sundayschool. It’s a GREAT BOOK to have for PARENTS. It’s simple, down-to-earth, interesting and relevant to the kids. Above all it is SCRIPTURAL. 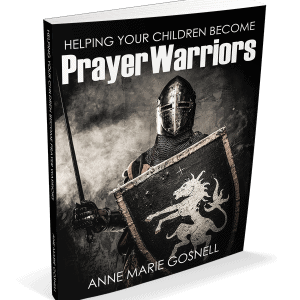 This book will HELP YOU TO MOLD YOUR KIDS in FORMING a STRONG SPIRITUAL PRAYER LIFE. If kids can develop this HABIT OF PRAYING (reading the Bible, praying the scriptures, meditating & memorizing the scriptures) and PRACTICE IT DAILY in their time alone with God, he/she will have a RENEWED MIND, GOOD ATTITUDE and STRONG INNER MAN in facing any circumstances in life. The world is throwing all sorts of garbage to your kids and the devil is trying his best to destroy them. Thus, parents GRAB this book and START your kids EARLY to prepare, equip and protect them. Many examples of how and why to teach your children to pray. Also scripture cards at the end. I hope to use this information with my Sunday School Class. Can be used with children of all ages. . Short and to the point. Bibically based. I received a digital copy of this book in exchange for my honest opinion. EXCEPTIONAL!!! This was incredibly well done! This isn’t just a book on prayer, it is a prayer MANUAL for our children!🔥⚔️🙏🏽This covers so much and the table of contents with prayer chapters labeled makes it an easy to maneuver resource! Love the scripture cards at the end! Well done! But honestly, anything Anne Marie puts out for our children is a BLESSING! What God Is Doing AND Walk This Way AND NOW THIS BOOK! Thank you Anne Marie for your dedication to the Lord and your ministry into sowing into God’s little lambs! I received a digital copy of this book in exchange for my honest review. Prayer is an important spiritual discipline to teach our children. This book gives many practical and pointed ways to teach our children about prayer and how to pray. It is an easy read, short and concise. Making it easy to read and practice one chapter at a time. The scripture cards to go with each chapter are great. I received a digital copy of this book in exchange for my honest review. I enjoyed using this book with my kids. Prayer is such a personal thing for me; I am very introverted. So, even though I have a very active prayer life, I have a hard time sharing it with my children. This book has some nice guidelines and verses broken down into managable lessons. So far, I have most enjoyed the scripture based prayers. I do wish however that it were more scripted / directed towards the child as opposed to being directed toward the parent. We will continue to use this book to go along with our study of the armor of God and the integumentary system. I received a digital copy of this book in exchange for my honest review. I believe that prayer is a crucial part of the Christian experience. Unfortunately, it is not my strongest area. That weakness makes it challenging to share this experience with my children. 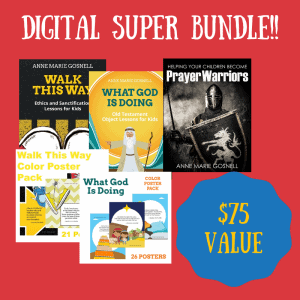 Anne Marie Gosnell’s book clearly explains different ways and times to pray. Each topic has a one- or two-page explanation that covers the importance of praying in that situation, easy explanations and a little bit of how to. The back of the book also contains corresponding scripture. Some of the sections include corresponding activities that reinforce the idea. I would have liked to see activities for each topic. Each section ends with a “Prepare to Pray” section. Some of the topics had unique information her. Unfortunately, the majority of the sections had the exact same wording here and did not present any new ideas. I would have liked to see more independent suggestions. Overall this is a good book and I plan on reading it again and working through it with my children.